Summer is a great time of the year to relax on the patio while entertaining friends and family. 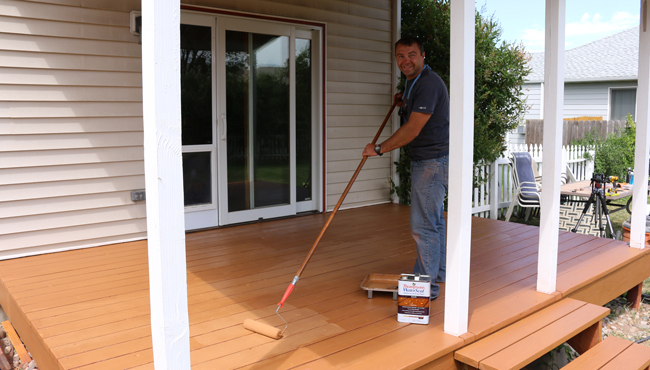 To keep a deck looking great, it’s important to protect the wood by applying a water-sealing deck stain. For this tutorial, I’ll show how to restore an old deck that has been painted, has flaking paint, and is showing its age. Because paint is somewhat of a process to get rid of, we’ll be removing it as best as possible using a sander to remove flaking or pealing areas. We’ll use Thompson’s WaterSeal to restore the deck. This is a sponsored post and I have been compensated for promoting Thompson’s WaterSeal products. Please note that I only recommend products I use myself, and truly believe in. 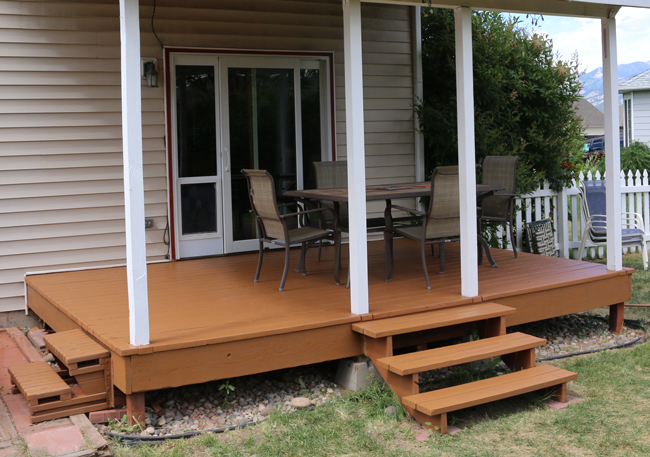 I know from past experience that Thompson WaterSeal products will help deliver beauty and lasting protection so you can spend less time maintaining your deck and more time using it with friends and family. 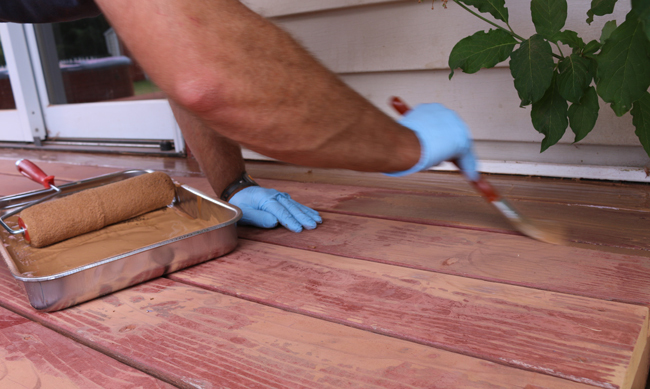 There are a number of ways to prepare the surface for staining. 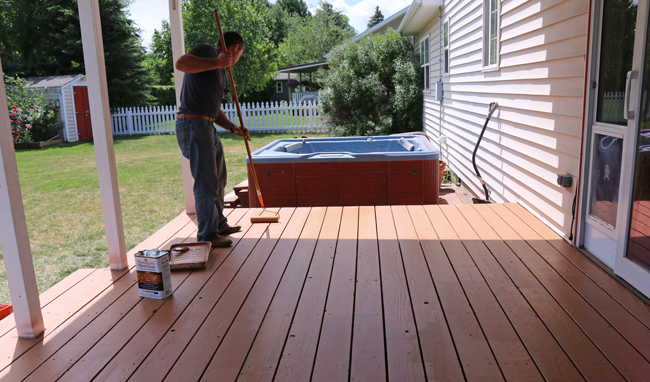 The deck boards can be prepped with cleaners such as Thompson’s WaterSeal 3 in 1 Wood Cleaner or Thompson’s WaterSeal Maximum Strength Deck Stripper. Since the paint was really thick, I chose to use a floor sander to remove the peeling areas as best as possible. 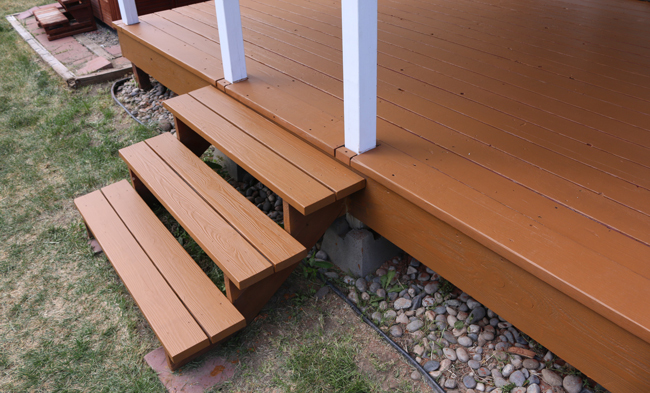 For more information and details about determining the best finish for your deck I’d recommend checking out the ABC’s & D’s of Deck Care videos which are super helpful. If you do sand to prep for the stain, I’d recommend first countersinking any screws that are not flush or below the top surface. 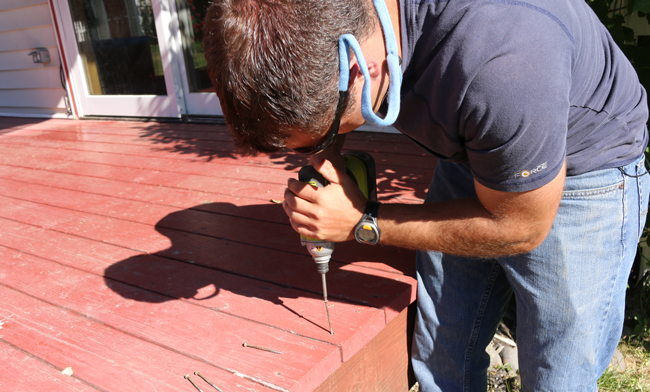 If the screws are old, you might even replace a few with new deck screws. I chose to sand the wood to prep it for stain. If it has not been painted, you’ll most likely be able to remove previous stains fairly easy. When paint or stain is completely removed, you then choose an opacity: transparent, semi-transparent or solid. I used Thompson's® WaterSeal® Waterproofing Stain – Solid in Maple Brown to give the wood an even finish since sometimes removing all the paint isn’t possible. 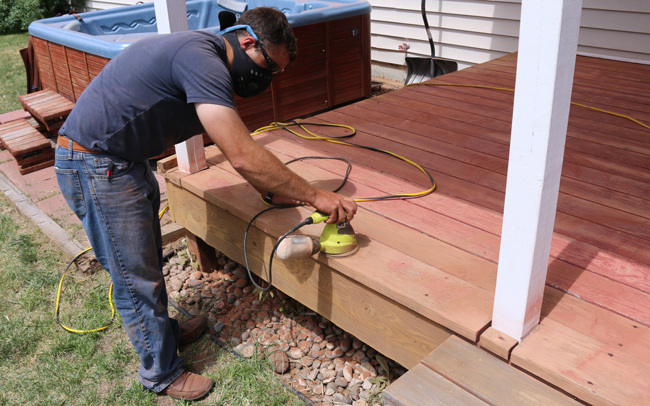 With a solid stain you won’t see the grain of the wood, but you’ll have a deck that will be sealed for years to come without issues. Remember to always read the manufactures instructions to ensure you use the proper application techniques, which will help you, get the best results. I used a floor sander to help remove as much paint as I could. If you don’t have access to a floor sander there are other options like Thompsons WaterSeal Maximum Strength Deck Stripper that will help with the process. 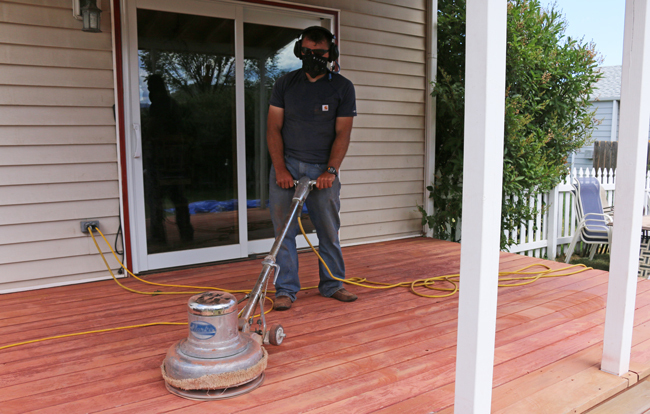 After sanding, use a broom to remove dust and debris. Shake the stain to mix it up, and then pour in a paint tray. Thompson’s WaterSeal stain can be ordered online or picked up at your local Home Depot store. Use a brush to trim around the siding, posts, and hard to reach areas. 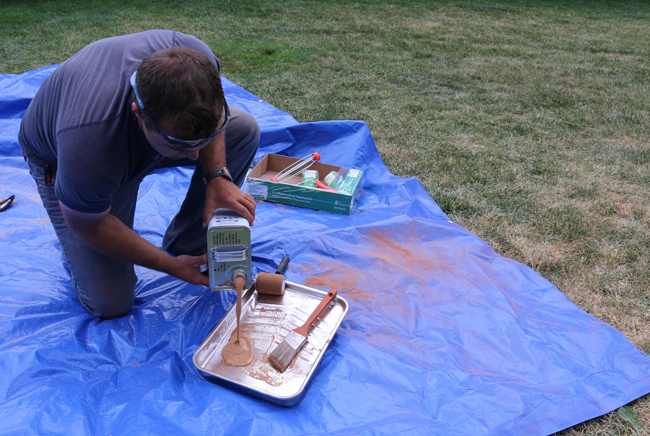 Apply the first coat of stain using a roller. You may need to use 2 coats if you are going over a lot of paint. I did 2 coats on this deck. 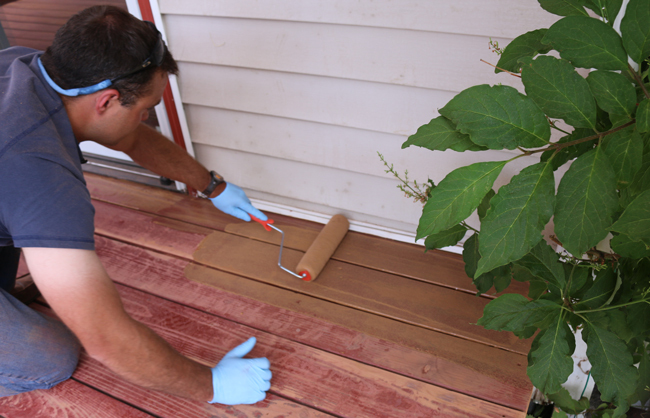 Work your way from the siding to the outside of the deck. Allow the stain to dry completely according to the directions. Then put your furniture back in place and enjoy your newly restored deck! 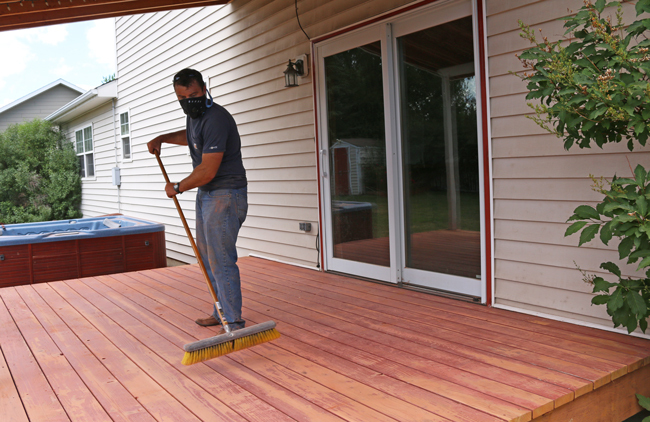 If you are interested in having the Thompson's WaterSeal team give your deck a $20,000 makeover so you can hold the Deck Party of Your Dreams, enter here!